As the name suggest, Biobind is a fat binder. This one is produced in the UK by Direct Healthcare and marketed exclusively via the ChemistsDirect.co.uk website. 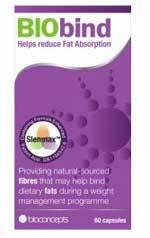 The leading weight management product in the UK today. A significant aid to slimming and weight control to those with a Body Mass Index of 18.5 or above. Contains three of the most effective natural weight loss ingredients on the market. Direct Healthcare appears to be a reputable company, but in 2012 they were forced to remove certain claims from their website after an investigation conducted by the ASA concluded the claims were misleading. Fat binders do not suppress the appetite or encourage the body to burn of excess fat. They have only one function—they limit the amount of fat the body can absorb after a fatty meal. Anyone who eats a healthy, low fat, diet will have no need for any form of fat binding product, but for those who cannot resist the temptation of fatty food, or whose lifestyle and/or work commitments make it hard for them to completely avoid such foods, fat binders can be a useful damage limitation device. Effective fat binding ingredients can absorb large amounts of fat, but they invariably prove too difficult for the body to digest, so they pass through the body undigested—carrying the absorbed fat with them—and are finally passed with the stool. One to two capsules are recommended prior to fatty meals, but no more than six capsules should be taken in any 24 hour period. Opunita Ficus Incida: Sourced from the ‘prickly pear cactus’, opunita ficus incida is a fibrous ingredient with proven fat binding abilities. Tests show the ingredient has the ability to block up to 27.4% of ingested fat. Chitosan: Chitosan is a natural compound derived from sea-living crustaceans, including lobsters and Icelandic deep sea shrimp. The fat binding potential of chitosan has been put under the microscope on several occasions, but test results can be conflicting. Psyllium Husk: A fibre form extracted from the seeds of the plantago ovate plant, native to India. It is has proved to be very beneficial as a laxative, but the ingredient’s fat binding potential requires further study. The manufactures fell foul of the ASA and where found guilty of misleading advertising and exaggeration. Biobind should not be used alongside medication or any other supplement without prior medical advice. Pregnant and nursing mothers should also consult their doctor before commencing any form of supplementation or weight loss regimen. Fat binders are designed to help dieters limit the amount of damage caused if they err from a low fat diet. As a weight management tool their use is very limited so fat binding products should never be seen as an overall weight loss solution. Many people do not understand this, which may account for the profusion of negative reviews Biobind has received. The actress Gemma Bissix is obviously aware of Biobind’s limitations, and uses it conjunction with her existing weight management regimen, so it is little wonder that her enlightened view to weight management has reaped such positive results. The majority of users who are educated in the correct use of fat binders will probably find Biobind a useful addition to their arsenal of weight management tools, but the lack of inclusion rates is an issue and—despite the problem of user ignorance about the correct application of fat binders—some alternative product have attained higher amounts of positive feedback. So will Biobind work? Probably, but some of the alternatives available will probably work much better. According to the Chemist Direct website the RRP is £29.95 for 60 capsules and the illusion of a bargain buy is provided by offering a 50% reduction in price. Postage and packaging adds around £4 to the price. Purchases do not appear to be protected by a money back guarantee.